A concrete house pad, more typically referred to as a slab, or slab-on-grade foundation, must be properly planned for and poured to ensure that it will adequately support the structure. One of the first aspects of slab construction that must be taken into account is the dirt work. Dirt work, or sub-base and sub-grade preparation, is key to ensuring that the slab will be evenly supported and not fail. Top soil must be removed from the site before sub-grade fill can be compacted and base material imported. A layer of crushed stone is laid on top of an even and compacted subgrade. Consult local building codes prior to beginning slab construction. Governing jurisdictions typically regulate several factors related to slab preparation and pour, including necessary setbacks and placement. Often, an inspection is required between base preparation and the concrete pour. Scrape vegetation and topsoil off of the site. The depth to which the subsoil must be removed depends on the soil type and thickness and height of the planned slab. A well-drained, sandy site may require only enough soil be removed to accommodate the stone sub-base and the concrete slab. If the soil has a high loam or clay content, several inches of soil may need to be removed and replaced with a sand or gravel mixture. For shallow excavations, hand tools may be adequate but for sites where more than a few inches of soil must be removed, machinery may be warranted. Compact the sub-grade material using a hand tamp or machinery. Recognize and fill in low spots. Pound stakes into the ground in each corner and every several feet along the sides of the site perimeter. Stretch out and tie strings between the stakes at the height of the planned sub-grade. Ensure that the strings are level using a string level. Move soil around or import fill to fix any low or high spots. Compact the fill that is rearranged so that this sub-grade layer is uniformly dense and level. Raise the strings or temporarily move them. The new height indicated by the strings should reflect the planned sub-base layer thickness, about 4 to 6 inches or as dictated by local code or a professional engineer. Place the crushed stone for the sub-base on top of the sub-grade material. Only place enough at a time to create about a 3-inch layer of stone, spread it around with a garden rake or other tool so that it is roughly even and compact it before placing the remainder of the stone. Replace or check the guide strings to ensure they are level and spread the top layer of the crushed stone. Bear in mind that most slabs must have thicker concrete around the edges to support the load. For a specific situation, this may be dictated by code. 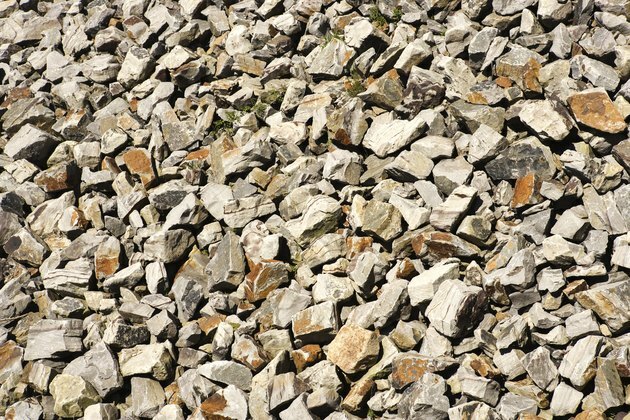 To accommodate thick slab edges, slope the gravel near the edges so it is thinner around the perimeter. Compact the crushed stone, check to make sure it is level and make any corrections before continuing with slab construction.